Japan Display Inc. (JDI) today announced details of its new lineup and series of memory-in-pixel (MIP) reflective-type color LCD modules. In addition to the previously announced 4 models, the company has unveiled 3 models with further power consumption improvement. Shipment of module sample will start in January 2016, and they will be rolled out in turn. Mass production is scheduled to commence in March 2016. The new lineup of LCD modules achieves further power consumption reduction, achieving approximately 0.5%*2 (1.28-inch achieves ≦ 1µA) versus that of the previously announced MIP reflective-type color LCD. This will allow customers to replace the current passive-matrix monochrome LCDs (segmented LCDs, dot-matrix LCDs, etc.) 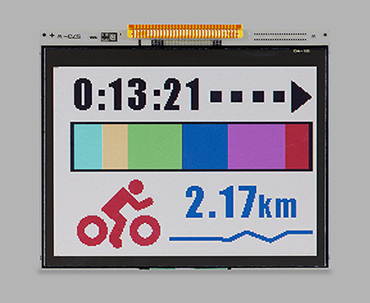 with active-color LCDs without an increase in power consumption. With its new reflective-type color LCD modules, JDI’s goal is to empower not only battery-powered devices, but also future devices for the "Internet-of-Things" (IoT). In the future JDI intends to further expand its lineup, in addition to these 3 new modules, to meet the diverse market requirements for low power display. *3 4.40-inch LCD module sample will not be available until April, 2016, with mass production shipment planned in June, 2016.